Il Fornello has launched a Three-Course Prix Fixe Winterdelicious Menu for $25 from January 12 to February 11 at 7 GTA locations. No that's not a typo! It is Winter... De... licious. Not to be confused with the concurrent Winterlicious program run by the City of Toronto. Being a chain, Il Fornello does not fit the criteria for the city's program, although many folks may be forgiven for forgetting that it is one. It has managed to remain integrated into the neighbourhoods it serves, with a relatively low key independent restaurant feel. But wait, it's not just a decent meal on the cheap. Il Fornello will donate $0.75 from each prix fixe dinner sold to Daily Bread Food Bank. Il Fornello diners will enjoy an authentic Italian style comfort menu designed by Chef Steven Silvestro, who is excited about the Stone Soup appetizer. Chef Silvestro: "It's the ultimate winter comfort food, served with a drizzle of olive oil, some crusty bread and a glass of wine. It covers all the major food groups: vegetables, grains, legumes, and protein. Since learning this recipe 15 years ago, I've come to appreciate the lengthy flavour-building process, which reminds me of my Nonna, who always had something simmering away on the back burner." Chef Silvestro's Stone Soup is a dish rooted in folklore and tells the story of a hungry traveler who persuades famished villagers to work together - and contribute one item from their own food supply - to create a delicious soup which feeds them all. "The story of 'Stone Soup' is a perfect example of how a small amount from many can benefit the whole group" says Ian Sorbie, President of Il Fornello. "We're pleased to partner with Daily Bread to raise both awareness of, and funds for, the good work that they do. In addition to donating $0.75 for each Winterdelicious prix fixe dinner, we will also be donating $0.75 from every à la carte Stone Soup we sell". Gail Nyberg, Executive Director of Daily Bread Food Bank agrees. "Every little bit helps," says Nyberg: "I'm glad to see businesses like Il Fornello getting involved and giving back to their community. It has been a very difficult year for food banks and Daily Bread Food Bank is grateful for their support." Tasting Toronto had the opportunity to enjoy an intimate dinner with Ian, to sample the nine items on hand for the three-course prix fixe menu. Naturally, we had smaller servings than you'd expect if you were only ordering three courses. 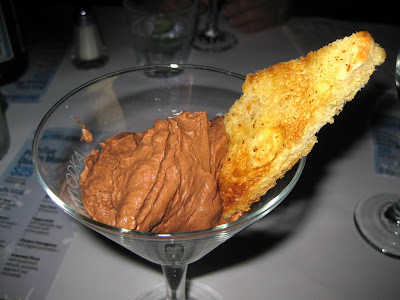 If we had to choose, we'd get the crostini, papardelle, and chocolate zabaglione. You can smell the truffle oil on the crostini before it landed on your table. 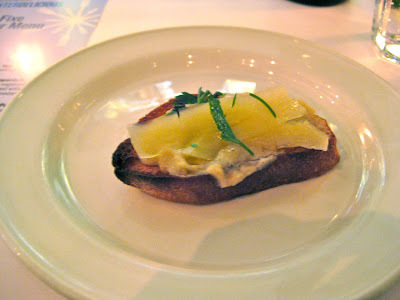 The celery root puree under the salty slivers of grana padano was delectably comforting. 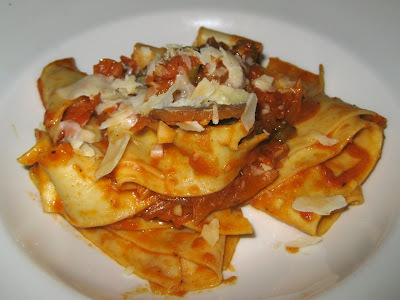 The papardelle was perfectly cooked, with just the right firmness. The chocolate zabaglione was heavenly. Yup, chocolate overload. The calamari was also good, and so was the pizzette with potatoes and crispy shallots. It's a good thing we didn't have to choose. But lets not forget the soup. If that crostini wasn't there we'd choose the hearty stone soup. Have the prix fixe at Il Fornello, and help a good cause. If you're not getting the prix fixe, have the soup. Every little bit counts.